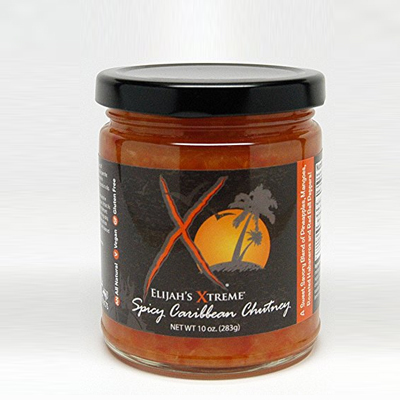 A sweet and tangy sauce made with pineapples, mango, red bell peppers and habanero is what makes Elijah’s extreme Caribbean chutney. It’s healthy, natural and gluten-free and serves as a balanced and well-blended marinade for grilled and baked chicken. Made with non-GMO ingredients such as Thai chilli, garlic and ginger, this Super Hot Chili Sambhal will bring an Asian flavour to your chicken meal. Neither so hot nor sweet in fact moderately spicy; you might find the flavour similar to Sriracha but with more nourishment and taste. Mr Spice ginger fry sauce for chicken dishes is a sweet treat to your meals. With no additional salt, gluten or wheat, it is not only a delicious stir-fry sauce or marinade but also a delightful dip that goes well with wings and chicken strips. What could be tangier than fresh kiwi, jalapenos, tomatillo, lime and cilantro on your chicken steak? An award-winning salsa sauce that spices up the taste of poultry dishes, fajitas and tacos. Flavour with only a few calories is a rare combination to find. If you are bored of having the traditional red pickle and relish with chicken, give it a rub of Green Tomato Relish by Prissy’s of Vidalia. It’s a Georgian recipe relish made with green tomatoes, cabbage, red bell peppers, onion and spices; meant to give chicken and meat a unique tangy flavour. Although the main ingredient of Harry and David Pepper and onion relish are very ordinary, the extraordinary flavour comes from Zinfandel wine. A sweet, peppery and bold blend of tomatoes, jalapenos and red peppers, it tastes great with chicken, cheese and ham. If you are fond of creamy, nutty flavourful sauces then this Japanese sesame miso dressing by Wozz Kitchen Creations is just for you. Healthy blends of Dashi, toasted sesame, Mirin, ginger and non-GMO miso will make your chicken steaks, wings and hot dogs scrumptious and nutritious. There is a flavour in simplicity too and the best example of this is the Happy Hal’s Jalapeno Relish. Made with jalapeno and white vinegar, it’s a simple recipe that makes any chicken meal tangy and spicy. It’s so versatile; you can use it as a topping on your pizza and cheese toast as well. Meadowcroft follows a family traditional recipe of old relish. With green tomatoes, onions, peppers and cabbage, it’s an all-natural vegan sauce that gives a sweet and savouryflavour to all kinds of poultry dishes. This Cambodian chicken dressing is a creamy blend of coconut, fresh lime, Thai chilli and Southeast Asian spices. Bringing the Thai Asian flavour to meals, this coconut peanut sauce is GMO-free and very healthy even as a dipping sauce. Ballymaloe tomato relish is chef Myrtle Allen’s famous ‘Ballymaloe House’ recipe. It is a blend of sun ripped tomatoes and spices. It gives a sweet and sour taste to meals. Besides being healthy and nutritious with no artificial additives, Ballymaloe is also very long lasting to store in the pantry. Knorr Chicken Tonight white wine sauce may seem a bit pricey as compared to other chicken dressings but the taste is worth it. A quick and easy recipe that will remind you of your childhood favourite country French chicken and bring old times to your dinner table. If you are fond of jalapenos and like your chicken dressed up in sweet and spicy flavours, you must try Ragin Cajun Fixin’s relish. It’s not only enjoyable with chicken but also tastes well with eggs, cheese toast and pizza. This sauce by Wozz Kitchen is a strange yet delicious combination of cranberries, oranges tossed in cognac liqueur and fresh spices. It gives a sweet and spicy flavour to poultry dishes without adding any preservatives or artificial flavour to it. An authentic Japanese restaurant recipe to charge your boring chicken dishes. Made with ginger, garlic and onion, it’s tangy, healthy and very different from other ginger dressings. A flavorful blend of taste, aroma and fine texture. With this list, it’s certainly the time to revamp your weekly menu. These relishes and sauces will take your weekend parties to the next level and bring new flavours to your dining table. From onions, garlic and ginger to cherries, cranberries and green tomatoes; these chicken dressings are a healthy way to enhance your taste buds and give you variety of methods to cook, marinade and dip your chicken, each day.